Models of Chinese Chang'e IV Relay Satellite, right, and Lunar Probe Consists are displayed during Zhuahi Airshow 2018 (Nov. 7, 2018). Once again, China is achieving a global first in space – and right on schedule. By 2019, China will become the first nation on earth to have sent a Lunar probe to the far side (sometimes called the dark side) of the moon. On December 8, 2018, China launched its Chang’e 4 lunar spacecraft atop the Long March 3B from the Xichang Satellite Launch Center, in Sichuan province. By New Year’s Eve, China will attempt to land its robotic probe on the 115 mile (186 kilometer) Von Kármán crater, at the South Pole-Aitkin basin. This is where the lunar ice is. Jun Huang, from the School of Earth Sciences at the China University of Geosciences in Wuhan, along with others, explains the focus on this particular landing in a paper for the Journal of Geophysical Research. While Western media coverage tends to ignore or deliberately downplay China’s space achievements, to include the Chang’e 4’s attempt, China has yet again proven that it is dead serious about its deadlines set for its ambitions in space. The ambition to land on the far side of the moon was articulated by China’s space agencies years ago, and 2018 was set as the year when they would launch. And here we are, in 2018, with another Chinese space mission goal achieved as per the deadline set. This meeting of deadlines set has been the trajectory of China’s unmanned (1999) and manned space missions (2003), its space stations, the Tiangong 1 (2011) and Tiangong 2 (2016), as well as the indigenously built cargo spacecraft, the Tianzhou 1 (2016), which docked with the Tiangong 2. Landing on the far side of the moon has its own technological challenges; for example, how to maintain direct radio contact when the moon will be directly between the probe and Earth. To solve that problem, China launched the Queqiao relay satellite in May 2018, and located it in the L2 Halo Orbit, which is the Earth-Moon L2 Lagrange point. That would then help transit telemetry back to ground stations on earth via its S-band antenna. Moreover, X-band data will be utilized to provide for the communication path between the lander and rover. The use of Chinese mythology to name its lunar mission Chang’e (moon goddess) and the relay satellite Queqiao (magpie bridge) evokes deep seated societal connections to such missions. Significantly, China’s ambitions for the moon and outer space have only been growing, to include ambitions of a Chinese research base on the moon, as well as developing bioregenerative support systems to ensure that humans can settle and survive in lunar conditions. In 2017, Beihang University in Beijing, created a lunar lab, Lunar Palace 1 or Yuegong-1, simulating the moon’s surface here on earth. Eight students lived in lunar-like conditions for about 365 days, a first for humanity again. The chief designer of Yuegong-1, Liu Hong, specified that this “test marked the longest stay in a bioregenerative life support system (BLSS), in which humans, animals, plants and microorganisms co-exist in a closed environment, simulating a lunar base. Oxygen, water and food are recycled within the BLSS, creating an Earth-like environment.” The students grew potatoes, wheat, carrots, string beans, and onions. According to Wang Ju, from the China Academy of Engineering, this test had critical implications for human ambitions to achieve long term stays outside Earth, especially for the establishment of a lunar base. Similar but smaller bioregenerative support systems will take a ride on China’s future lunar and Mars probes to test the robustness of these experiments in the actual conditions of space. China’s achievements in space follow an incremental strategy of developing its space capacity, first securing the ability to send humans into outer space, followed by robotic missions that both enable space science and build its capacity for long-term presence, then launching its permanent space station, to be followed by deep space exploration and exploitation. Toward this effort, the Chinese Communist Party (CCP) has committed its resources and leadership focus on building both capacity (civil and military) and legitimacy for its outer space missions. For China, space, like its engagements in the Antarctic continent, offers both the possibility for science as well as future resources from the moon and asteroids. China’s state-owned and funded space agencies, including the China Aerospace Science and Technology Corp (CASTC) and the China National Space Administration (CNSA), strictly monitored and ideologically committed to the CCP, are tasked with setting policy for space. Their roadmap indicates that between 2020 and 2045, China aims to achieve several significant milestones regarding space technology. This includes a Mars probe by 2020, an asteroids probe by 2022, a Jupiter mission by 2029, a reusable carrier rocket by 2035, and a nuclear-powered space shuttle by 2040. In a report published in the front page of the People’s Daily, a newspaper tightly controlled by the CCP, the China Academy of Launch Vehicle Technology (CALVT) specified that nuclear powered spacecraft would augment larger payloads, and enable China to commercially explore and exploit the natural resources available in space by 2040. Professor Wang Chunghui, associate professor of aerospace propulsion at the School of Astronautics at Beihang University, stated, “The nuclear vessels are built to colonize the solar system and beyond.” This perspective to achieve the capacity for human colonization in space was supported by Liu Hong, chief designer of the Yuegong-1. China’s societal interest in outer space has increased incrementally over the last few years, with a surge in Chinese science fiction novels, to include the world famous The Three Body Problem, as well as increased private sector space companies established since 2016, like OneSpace, LinkSpace and LandSpace. President Xi Jinping has made China’s mission in outer space a priority for the CCP, which controls the Chinese state’s funding and policy priorities. The critical importance of outer space to the CCP is determined by the fact that space scientists and policymakers were a major player in the 19th CCP National Congress held last year. Xi has made it his priority to promote space scientists to important political positions, to include the promotion of former general manager of the CASTC, Ma Xingrui, to governor of Guangdong province, China’s largest economy in 2017. China Academy of Space Technology (CAST) President Yuan Jiajun, who led the Shenzhou manned space program, was made acting governor of Zhejiang province. Such focused promotions reflect two things: that the space scientists/policymakers have delivered on their promises, and that they are being rewarded for their successes. China’s strategy to establish long-term mission goals for outer space, incrementally build its space capacity and institutions, demonstrate technological prowess, and reward achievements in space implies that it will meet the goals its state-funded, and CCP-mentored space institutions have set for the country. It is not long before we see China’s permanent presence on the lunar surface, given it has met its deadlines set for the moon, to include the launch of Chang’e 4. 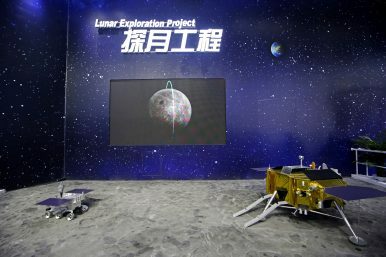 Given China’s preference for a “first presence” claim in areas rich in resources, its ability and commitment to get to the far side of the moon first to enable a long-term presence will empower the CCP to set the rules of the game in outer-space.